TAYYIP Erdoğan, Prime Minister of Turkey, said that in order to overcome the world’s multiple problems, a trust-oriented, diverse, fair and inclusive global order was necessary. “The global problems of our age necessitate global scale solutions.” He called for new leadership so countries could stop perceiving the world as a threat, to seeing it as a place of trust and solidarity. Everybody, regardless of their creed and colour, was responsible for constructing a world of peace, trust, justice, tranquillity and prosperity. He said that terrorism, the proliferation of nuclear weapons, hunger, poverty, growing pandemics, food and energy concerns, and rising xenophobia continued to pose grave challenges. In addition, global warming and the financial crisis required robust solutions. To ensure a more participatory global order, all countries must work together to make the United Nations more efficient, democratic and transparent. That would, in turn, allow the Organizations to make a greater contribution towards global peace and stability. The United Nations had to become more effective in tackling the world’s pressing challenges, including human rights and gender equality. In that regard, he said, Turkey endorsed reforming the Organization, which would be incomplete unless the Security Council was restructured and enlarged to include more non-permanent members. The United Nations peacekeeping system had to be improved, bearing in mind, among other things, capacity-building and regional coordination, he added. Turkey continued to be a force for peace and stability in its restive region. He said that over the past seven years, Turkey had made efforts to resolve its differences with neighbouring countries and to improve bilateral relations. It had also aimed to move from a relationship of “passive-good neighbourliness to one of active friendship and cooperation”. Talks with Greece were an example of such actions. Having initiated the “neighbouring countries process”, his country was still committed to political dialogue and creating national unity in Iraq. In that regard, Turkey was committed to maintaining the Strategic Dialogue Mechanism with Iraq in the fight against terrorism and to ensure bilateral relations. 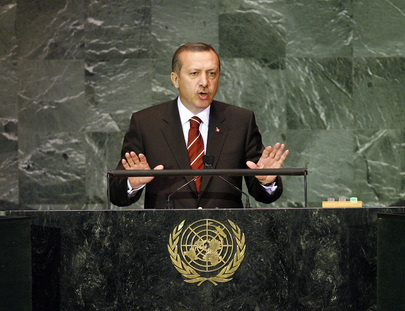 Turning to Palestine, he said Turkey was very sensitive to this issue and had always stood by the Palestinian people. Resolving the Palestinian-Israeli conflict towards two peaceful coexisting States was invaluable to global peace. Treating everyone fairly and equally would allow for regional and global stability. Turning to the fight against terrorism and ensuring stability and prosperity in Pakistan and Afghanistan, he expressed his country’s support in this regard. Turkey had convened a ministerial meeting on a democratic Pakistan in August. On Cyprus, he supported a comprehensive solution to the question of the island, citing the United Nations as the foundation upon which a solution could be built and the world body’s Secretary-General as a bridge between the two sides’ differences. A mutual solution would have to be reached by early 2010, he said, emphasizing that if Greek-Cypriot intransigence obstructed such a conclusion, “the normalization of the status of the Turkish Republic of Northern Cyprus will become a necessity which can no longer be delayed.” A fair and lasting solution in Cyprus would help transform the Mediterranean zone into a peaceful, cooperative and stable place. He added that the Turkish-Cypriot side was still subjected to unfair levels of isolation. Lifting that unfair practice would speed up the peace process. Regarding cultural diversity, he cautioned against seeing different cultures as “other”, stressing that they had to be seen as individual elements of humankind. The Alliance of Civilizations, a United Nations initiative that was co-sponsored by his country, would shape a global civilization based on universal values in democracy, human rights, youth and media.